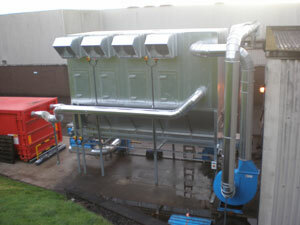 Dust Control Solutions Ltd design manufacture and install all types of dust control systems, fume extraction systems, odour control systems and pollution control systems for industry in the UK, in particular Carlisle. We also cover all areas of England, Scotland and Ireland. Dust extraction is Dust Control Solutions Ltd specialty. We can assist companies with wood dust extraction, such as wood burning plants, wood shredders and wood briquette machines. Cartridge filters for fine dusts, food industry including sugar and flour and other food products and welding fume extraction, are all in our remit, with all of our filters incorporating reverse jet filter cleaning. All of our fume extraction systems comply with current regulations with regard to handling hazardous fumes. Handling dangerous explosive gases, for example extraction from spirit stores in a distillery is also a process Dust Control Solutions Ltd can manage, as well as paint fumes dry back extraction systems. Our services engineers are available on call 7 days per week 52 weeks in the year in Carlisle and the surrounding area. On occasion we can supply temporary extraction should a serious breakdown occur.